Sight word carrot learning fun! This was our very first sensory bin. 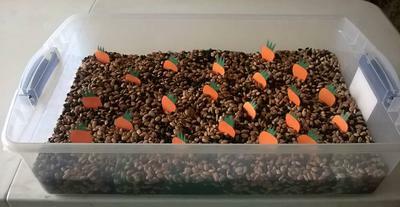 I used black beans and pinto beans for the bottom and made carrot sight word cards. They dig up a carrot, I read the sight word to them, and they repeated it. The girls loved searching for the carrots and they had so much fun learning in the process!